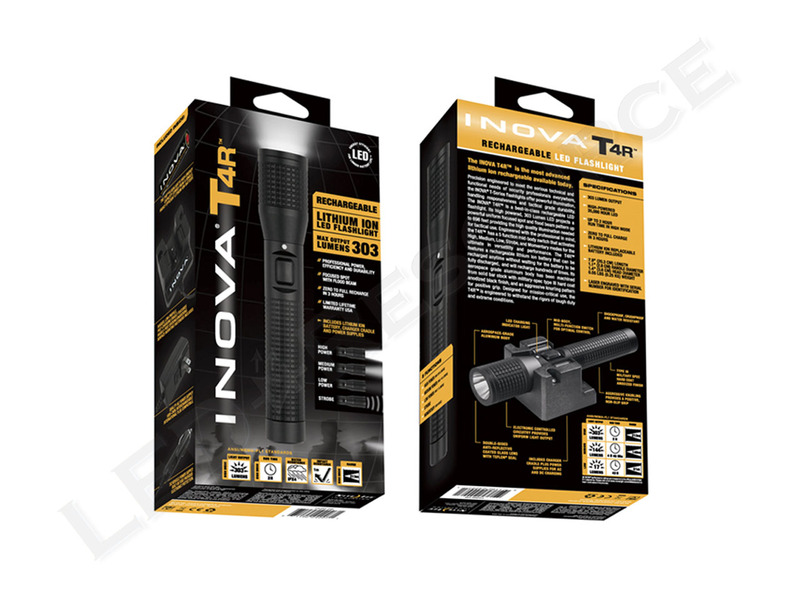 Designed to meet the needs of security professionals, the Inova T4R is a rechargeable LED flashlight engineered to withstand tough duty and extreme conditions. 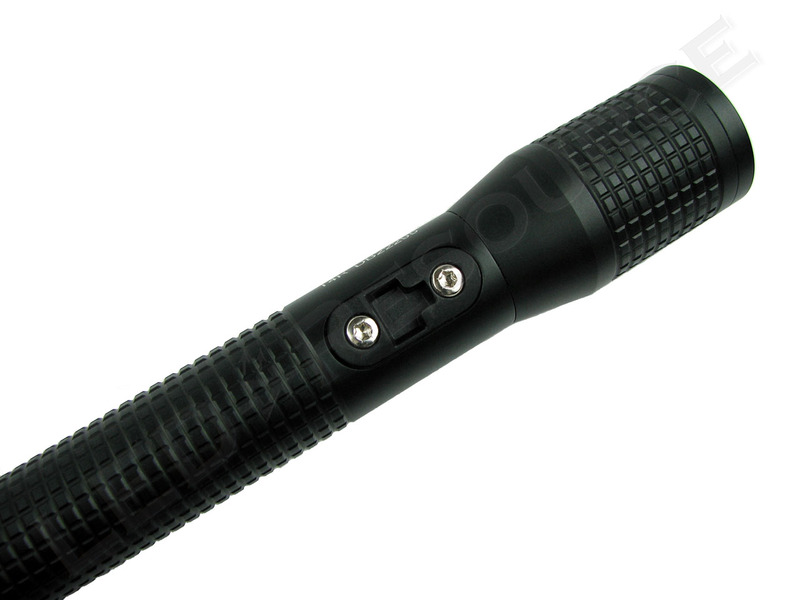 Rated to produce 303 lumens in its highest mode, this latest version of the T4R also offers two lower output modes and a built-in strobe function, all accessible from the electronic mid-body switch. Weight with Batteries: 8.81 oz. Available only in black with a MSRP of $149.99, the T4R is available from retailers for around $110. Numerous optional accessories are also available, ranging from signal cones to additional batteries and charging accessories. Packaged in a cardboard retail box, the T4R comes equipped with an assortment of standard accessories, including the following: Lithium-Ion rechargeable battery, low-profile charging cradle, AC adapter, 12VDC car adapter, and charger mounting hardware. 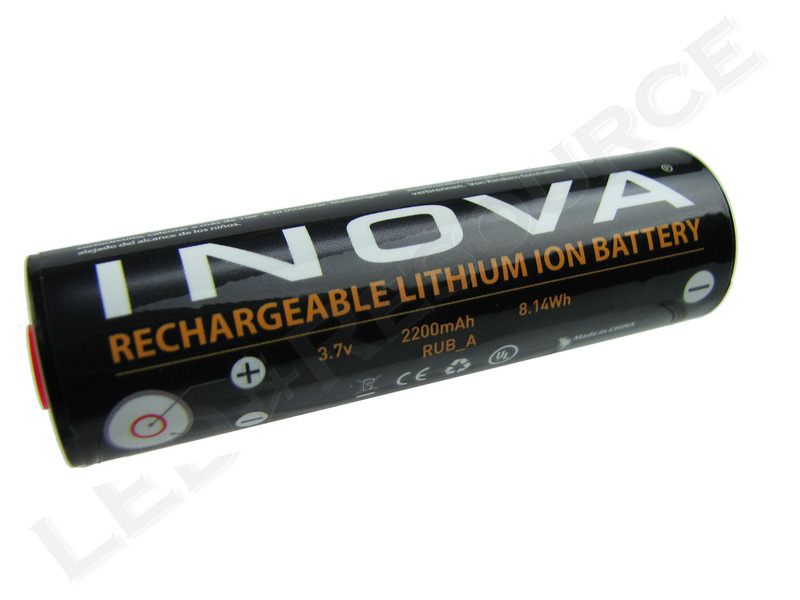 The T4R is powered by a proprietary rechargeable Lithium-Ion battery which has a rated capacity of 2,200mAh. The RUB_A battery can be recharged at any time, without having to wait for it to fully discharge. 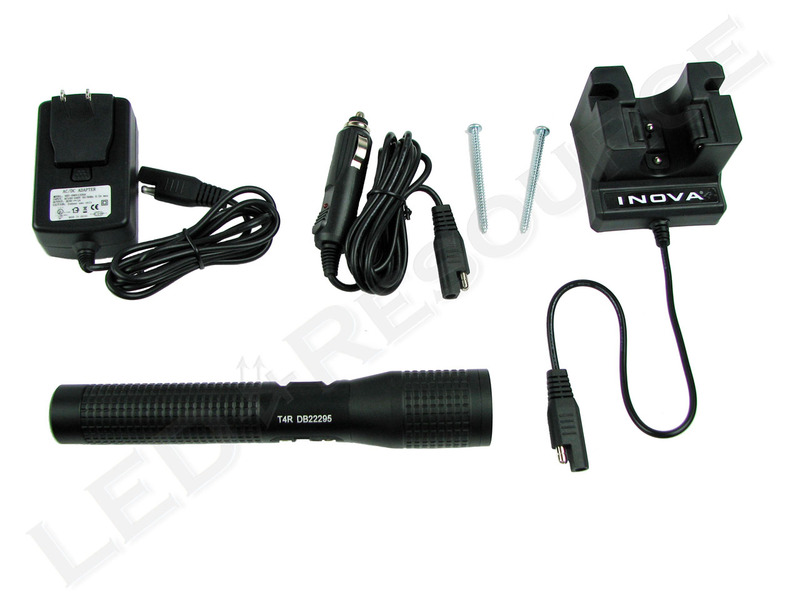 The battery is charged while still inside the light using the included cradle charger. 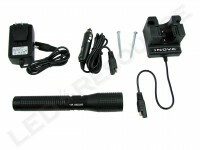 Able to be powered by household current or the 12-volt automotive adapter, the charger features spring loaded rollers to hold the T4R securely. 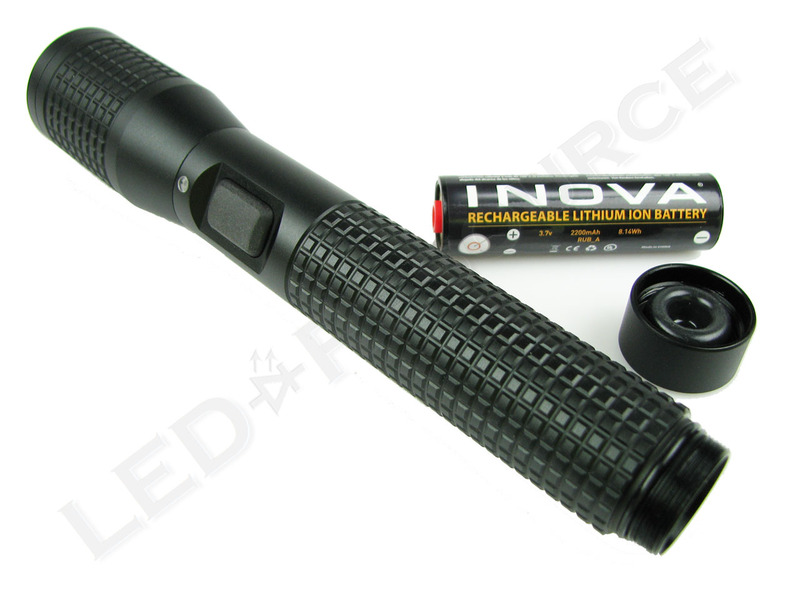 A keyed slot in the flashlight body ensures proper alignment when placed in the charger. Time required to recharge a fully depleted battery is 3 hours but normal times should be less depending upon the amount of remaining charge left in the battery. Charging status is indicated by a colored LED on the light body – red while charging and green when fully charged. 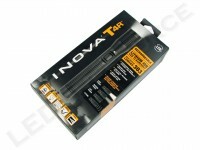 The T4R may be left in the charger without risk of overcharging the battery. Spare RUB_A batteries are available from Inova with a MSRP of $19.99 each. 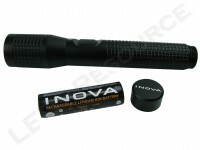 A body extension which can house a spare battery is also available for $39.99 and includes an additional RUB_A battery. The impact resistant head features a mineral glass window which has double-sided anti-reflective coating and a Teflon® seal. Housed behind the window is the machined aluminum reflector and LED. Machined from solid aluminum bar stock, the body of the T4R has a hard anodized black finish to resist wear and corrosion. The finish is smooth and even, with no defects or blemishes observed. The entire body is machined with a checkered pattern to provide additional grip. As the T4R utilizes a side-mounted switch, the tailcap serves only to hold the battery in place. 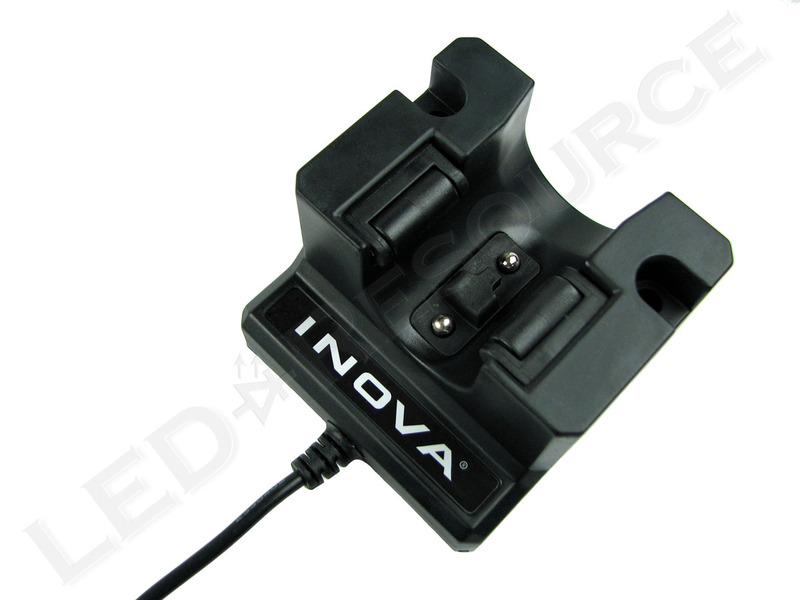 Also made of aluminum, the tailcap has the INOVA brand laser engraved across its end and features a flat design allowing the T4R to tail stand on a flat surface. 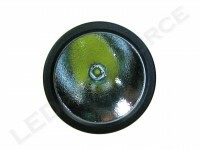 The light can be completely locked out, to prevent accidental activation, by unscrewing the tail cap just over two turns. All four operating modes are accessible from the electronic mid-body switch. While the light is off, press and hold the switch for more than ½ second. When the button is released, the light will power off. 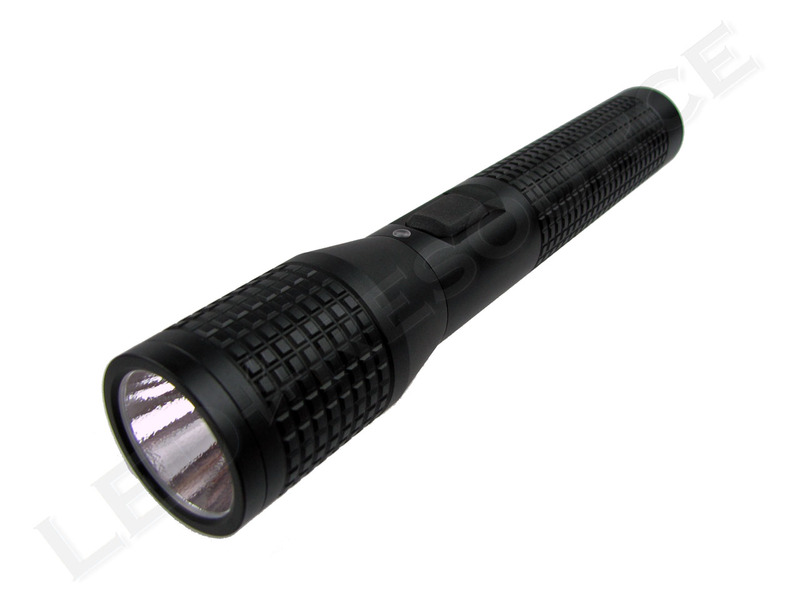 Full output of 303 lumens is triggered by the first press and release of the switch. After the light has been on for more than 2 seconds, a second press will turn the light off. When the light is off, pressing the switch twice within 2 seconds will activate the 144 lumen medium mode. 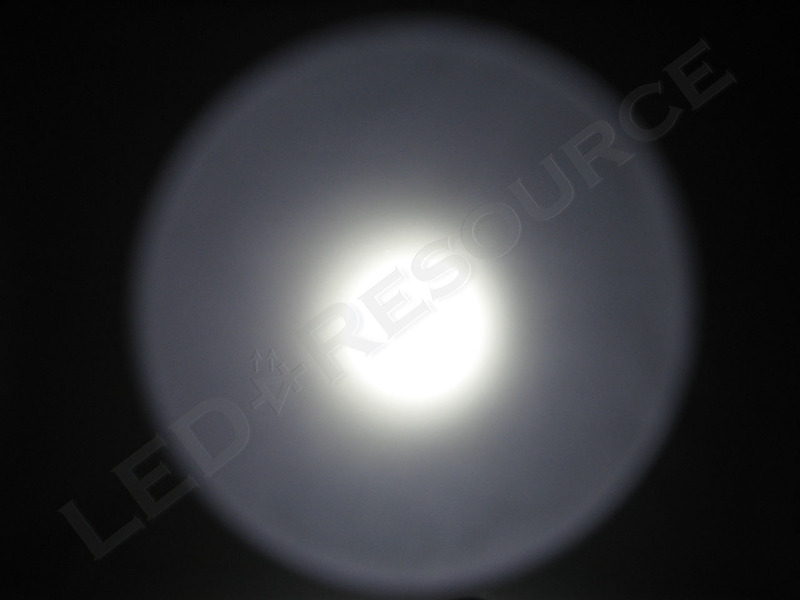 When the light is off, pressing the switch three times within 2 seconds will activate the 17 lumen low mode. Two rapid clicks will activate the strobe mode. Activation of the various modes is straightforward and intuitive with the highest level always available when the light is first turned on. The side-mounted switch functions well and is best suited for activation with the joint of the thumb. When pressed with the tip or pad of the thumb, operation can be somewhat inconsistent. 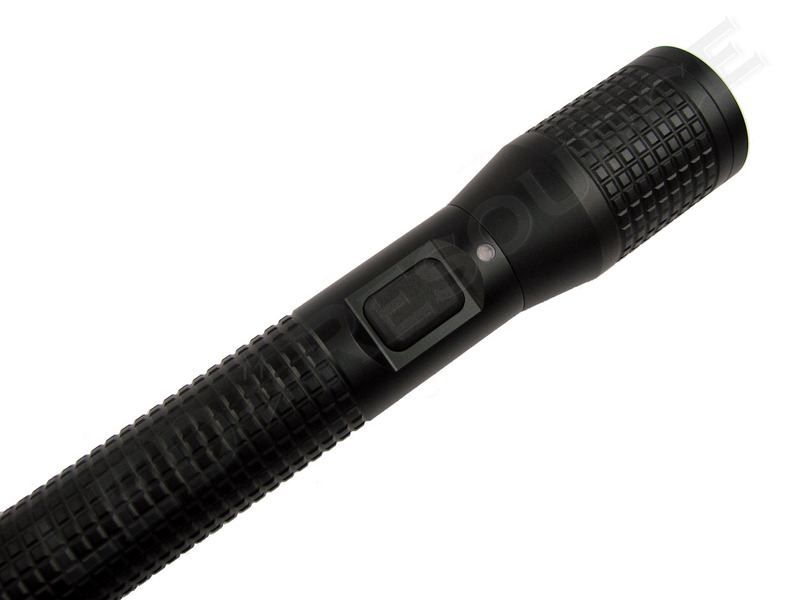 Utilizing a Cree XP-G emitter and textured reflector, the T4R produces a smooth and balanced beam with a focused spot surrounded by a wide spill beam. The beam is uniformly white in appearance with very little color tint. The T4R demonstrates very stable regulation when operated continuously, staying within 5% of its initial output. 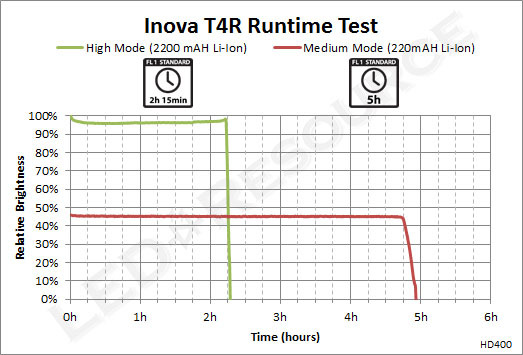 In both high and medium modes the T4R exceeded its rated runtime by 15 minutes, running for 2 hours 15 minutes in high mode and 5 hours in medium mode. To warn users of the need to charge the battery, the T4R begins a series of rapid flashes as it drops out of regulation. However, in continuous testing such as this, the warning is mostly useless as the light shuts off soon afterward. 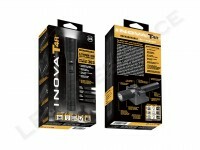 The Inova T4R is a solid light and provides an upgrade in output over its smaller sibling, the T3R. Construction is solid with no rattles from the head, tail cap, or battery, even under hard use. Fit and finish are also excellent. 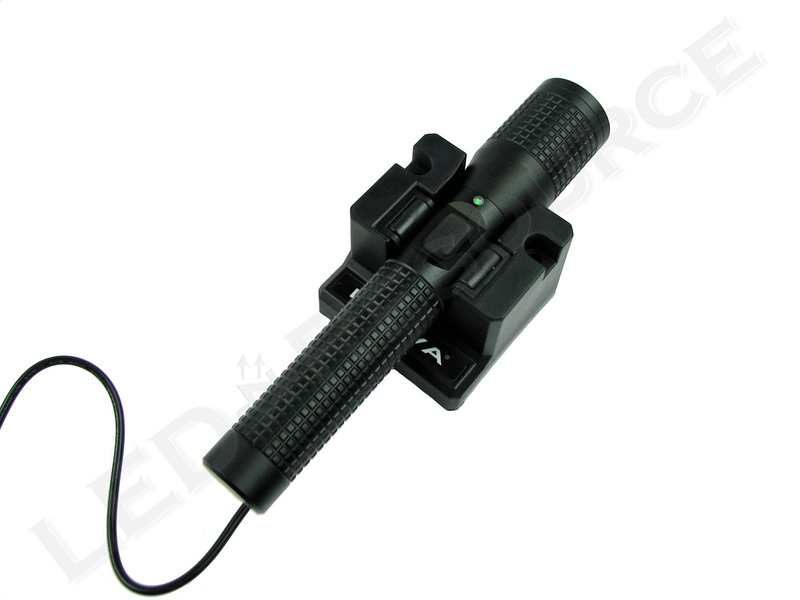 With the included charger mounted in place, the T4R is easily inserted and removed with only one hand. The charger itself is well constructed and holds the light firmly in place while charging. Users may purchase additional batters for use as “ready spares” when extended runtime is required. Unfortunately, as with other lights of this type, these batteries can only be charged while in the light. A separate external charger, if available, would be useful for this purpose. 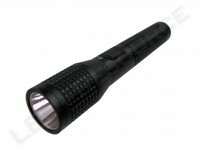 With its ability to provide 300 lumens of steady output, combined with over 2 hours of runtime, the T4R is an attractive option as a rechargeable duty light and is also well suited for use in an emergency preparedness kit with its lower output modes and even longer runtime – up to 43 hours at its lowest setting. Combined with its solid construction and affordable price point, the INOVA T4R is an attractive option among rechargeable flashlights. Contrary to what is stated in the article, the battery is rated 8.14 Wh which at a voltage of 3,7 corresponds to 2200 mAh instead of 220 mA. Great catch, fixed the typo.